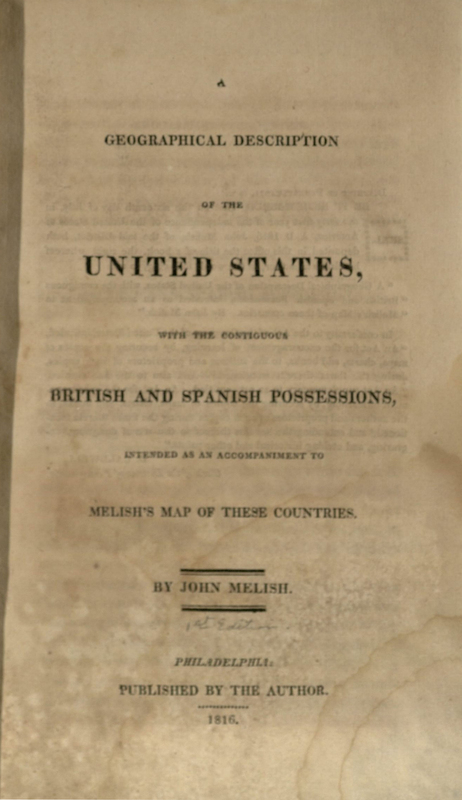 Although John Melish is not a name most people are familiar with, his map entitled Map of the United States with the Contiguous British & Spanish Possessions (1816) played a significant role in American history. Maps were often critical to international diplomacy, and inaccuracies usually led to conflict. John Melish was born in Scotland in 1771 and was orphaned at an early age. Despite this adversity, he established himself in the textile trade. In 1811, Melish emigrated to the United States in search of better economic prospects. At first, he wanted to try his hand at farming, so he traveled extensively throughout the United States to find an ideal location for his homestead. Melish took meticulous notes regarding his travels. He ultimately settled in Philadelphia a year later and decided to publish an account of his adventures. Something was missing however. Any good travel book, Melish thought, needed a map to supplement it. Thus, Melish set about the task of producing his own maps. Over time, Melish became a prominent cartographer. He died on December 30, 1822 after a short but prolific career in mapmaking. Map of the United States with the Contiguous British & Spanish Possessions. 1816. 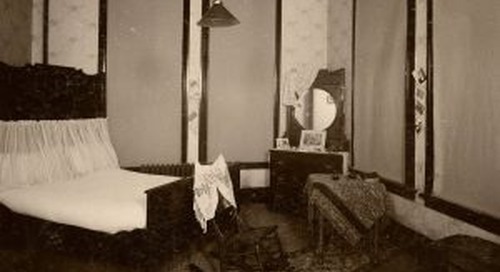 Room 201, The Texas Collection, Baylor University. One of the most important maps that John Melish created was a Map of the United States with the Contiguous British & Spanish Possessions (1816). 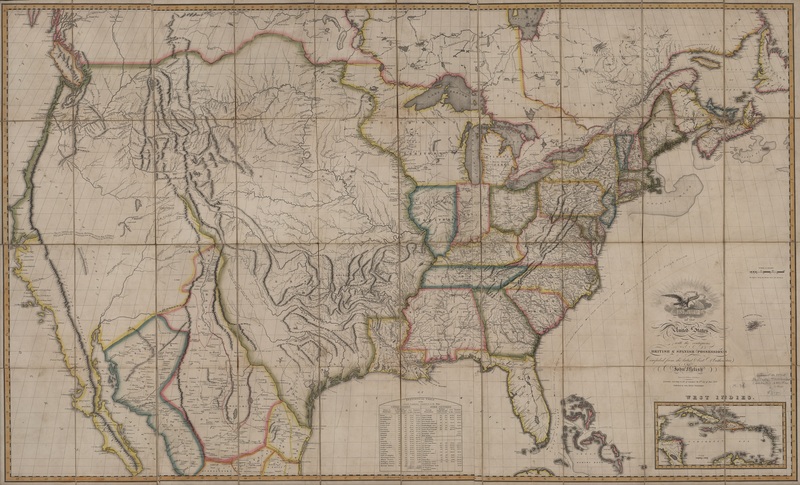 It was one of the first maps to illustrate the western border of the United States’ territory stretching to the Pacific Ocean following the Louisiana Purchase of 1803. 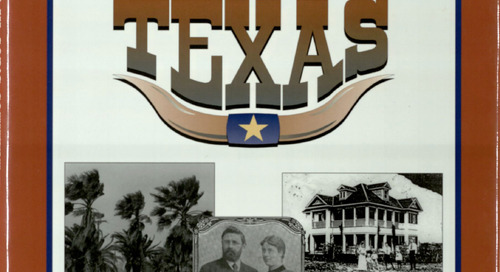 The Texas Collection owns a fifth edition of the map. Although ours is dated 1816, it was most likely released from the publisher in 1817. In all, there were approximately twenty editions of this map produced between 1816 and 1823. After one hundred maps were published and sold, a new edition was created with any up-to-date corrections. Melish’s work was so popular that even Thomas Jefferson had a copy hanging in the hall of Monticello. 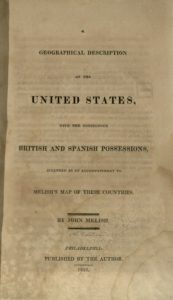 A Geographical Description of the United States: with the Contiguous British and Spanish Possessions, Intended as an Accompaniment to Melish’s Map of these Countries by John Melish. Philadelphia, 1816. The Texas Collection, Baylor University. A companion book entitled A Geographical Description of the United States, of which The Texas Collection owns a first edition copy, accompanied the map. Melish composed this book as a summation of all his thoughts and knowledge regarding the map, geography, and topography. It is interesting to note that in several sections Melish addresses the geography of Texas. You may have noticed that the map states that it was “compiled from the latest & best authorities.” In reality, Melish incorporated portions of other maps into his own; a practice that was quite common during this time period. Two of the maps Melish consulted are found in our collection: Carte Generale de Royaume de la Nouvelle Espagne (1809) by Alexander von Humbolt (which was the first map to depict the size and shape of the Rio Grande correctly) and Map of the Internal Provinces of New Spain (1810) by Captain Zebulon Pike. The Texas Collection also houses the two-volume companion book Pike published with his work. The influence of Humboldt’s and Pike’s maps is clearly seen in Melish’s finished work. All things considered, the map appears to be fairly accurate to the modern eye. However, looks, as the cliché goes, can often be deceiving. One of the reasons Melish’s map rose to such historical prominence was its role in the Adams-Onís Treaty of 1819. Stay tuned for Part 2 of this blog series to learn more about the treaty and how the inaccuracies of Melish’s map led to future conflict. Brooks, Philip C. Diplomacy and the Borderlands: The Adams-Onís Treaty of 1819. New York: Octagon Books, 1970. Ristow, Walter W. “John Melish.” In American Maps and Mapmakers: Commercial Cartography in the Nineteenth Century, 179-90. Detroit: Wayne State University Press, 1985. Ristow, Walter W. “John Melish and His Map of the United States.” In A La Carte: Selected Papers on Maps and Atlases, 162-82. Washington: Library of Congress, 1972. Library of Congress Quarterly Journal of Current Acquisitions. Stagg, J. C. A. Borderlines in Borderlands: James Madison and the Spanish-American Frontier, 1776-1821. New Haven; London: Yale University Press, 2009. http://www.jstor.org/stable/j.ctt1npjn3. “John Melish.” Thomas Jefferson’s Monticello. Accessed April 05, 2018. https://www.monticello.org/site/research-and-collections/john-melish.